I guess it all started with the new bike. OK, maybe Jeff and I had decided prior to September that we would focus on cyclocross rather than mountain bike racing. Really, it was me designing my relaxing summer, 3 weeks in Europe drinking rose and eating soft cheese and baguettes. Granted the TR hurt my ego and legs a whole lot. I had decided to take out a Masters license this year, and was keen to race once the fall came around. 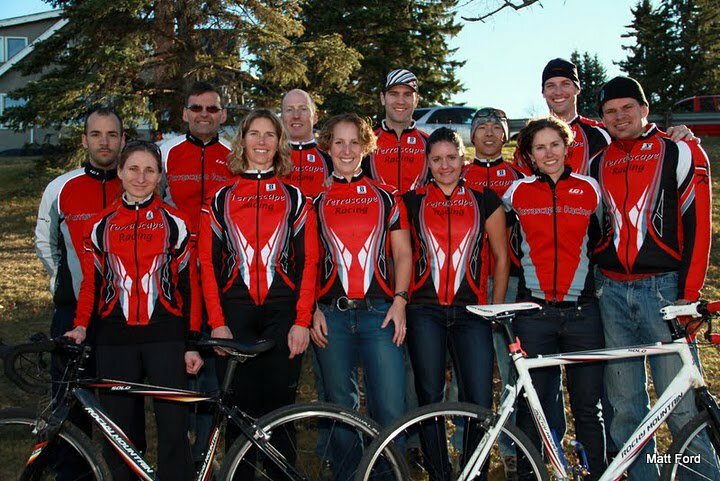 With that, we ramped up the cross season with racing Midweek Mayhem, and every weekend double header in Alberta, adding in some skills, intensity and cross specific drills during the week. I got stronger and stronger. Then my new bike arrived. What a difference 4 lbs makes!! And I love my Scott. Some light carbon wheels arrived soon after - and my results continued to improve with my fitness and skills. 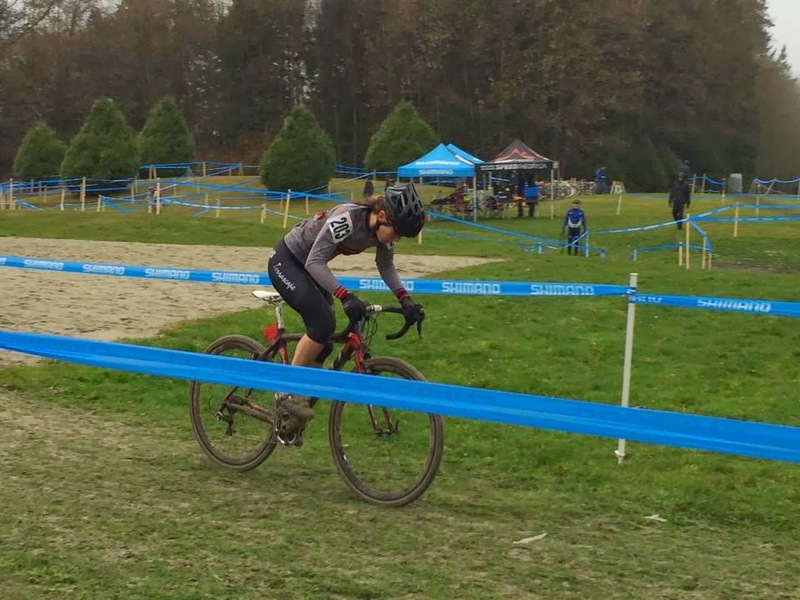 I had a great battle during Provincials with Lesley Baldwin, but was able to make a dynamic pass just before the off camber downhill before the steep climb back up. I needed to get in front as I was riding the step-up as well as the log barriers. The Kid's advice of 'Never let the wheel go' was always in my head, pushing me to stay with who ever was ahead. Master 30+ Provincial Champ!! Super happy with my result. Nationals was already on the program for a few of us, and Coach Jeff shaped my season and training to focus on that. I was looking forward to racing Master Women - not entirely where I would fit, but thinking that I would be in the mix. We booked a trip to Portland in between Provincials and Nationals to stay fresh and help keep our fitness and motivation. 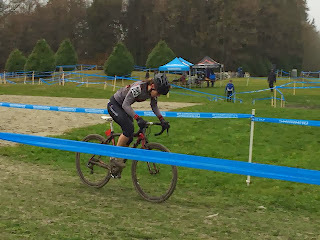 That proved to be a big helps as the Saturday race in Portland was a disaster in the mud, resulting in broken derailleurs and hangers for the Kid and I - but it was the first sticky sloppy smeary peanut buttery mud I had raced in all season. The Sunday race in Portland was also very cool because of the sheer size of the fields - over 150 women!! And the forecast for Nationals was 12 degrees and raining. Kristin and flew out Thursday eve, and ran in to Mical . Super fun course, 3 sand pits and some off camber corners just waiting for more victims. We were able to share a tent with Lance Adamson and his Cycle Smart crew, and a collection of Albertans - was great to have a home town crew out there. Even more amazing was our own Deadgoat Mani who drove wheels, trainers and more out, and cheered us on all weekend. 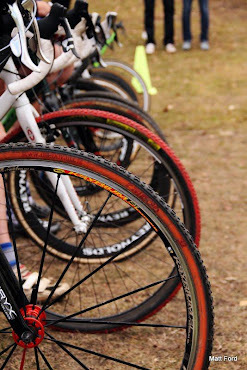 Race Day: Mud tires - thanks to Ray who loaned his carbon wheels with the tire of the day - the Clement PDX. Brakes rubbing - Jeff, Regan, Lance work some magic for me, and make the rub go away. One last tire pressure check - perfect. Start line: Long sleep jersey, and bib knickers. Perfect temp for racing. Grey, but not raining. What the...AHHHHH my front tire is flat!! 2 min to start, as they just fired the gun for the men. JEEEEFFFFFF!!! Jeff grabs a pumps and puts some air in - but will it hold? Do I have a slow leak? It still seems really soft!! Roll to start, look around, maybe I should add a gear.... and GO! Unfortunately, I should NOT have added a gear, and was turning my legs at 60 rpm in the soft sluggish wet ground. Find a better gear, but my feet can't find my pedals. Look up - I am many bike lengths behind the ENTIRE field. So that's it. Well, I was pretty fired up, and I knew I could catch a few girls, so I hammered to catch back on, and caught the field just after the first corner, was mid pack by the second corner, and was 5th or 6th wheel by the 3rd corner. Ok, I can make a race out of this. 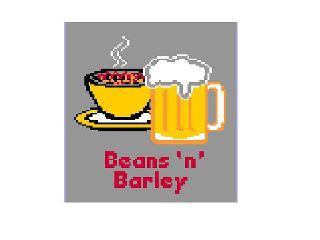 I'm still in it. Accordian into the first hairpin turn, and I make an aggressive pass to make it to second wheel - sorry for the elbow Kris! and now am chasing Janna Gillick, the 2012 Canadian Master Women champ. A good chase for another lap, but I focus on riding the sand smooth and hard, staying up right in the greasy muddy corners, and made the pass. Once I was in the lead I stayed hard on the gas, standing out of every corner and riding hard 2 out of the 3 sand pits, and running hard the other. Lots of cheering from the team and Jeff, and special thanks to Shantal for her splits, and positive coaching! We ended up doing one extra lap - so our race was over 50 minutes. Master 30+ Canadian Champ!! Super happy with my race and result, despite my gong-show of a start. Wow what a season - I never thought I would have done so well. I felt so strong and smooth, peaking perfectly for Nationals. Now, it's fat and sassy season.